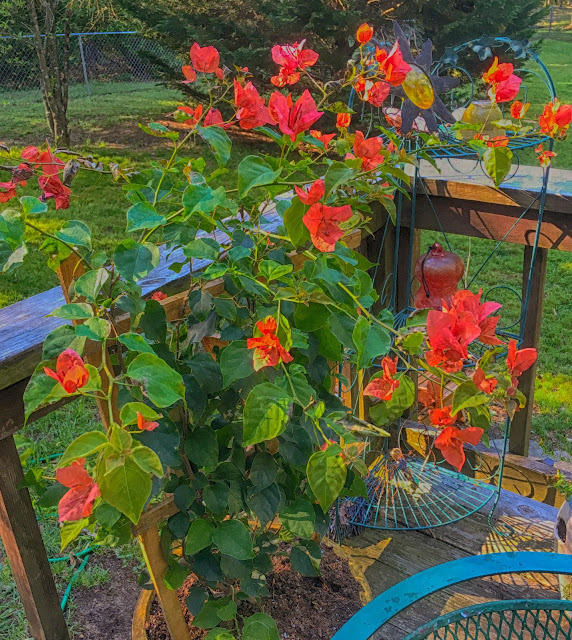 Yep, we bought a Bougainvillea this past weekend to round out our deck display. Now we have a Mandavilla and a Bougainvillea. One has flowers almost as big as my hand, and the other has blossoms that look like as small nimble Japanese gardener made folded origami flowers our of crepe paper. Both are beautiful to behold. Not much else to report tonight. My bones are weary and I'm out of words. So maybe I'll borrow a few from Jimmy Buffett. That song is favorite in the Operating room..good one to end the day with. I visited our local nursery today to pick up a plant for my Mom and really wanted to fill my cart with one of everything! Still too early to plant flowers around here but soon I'll be playing in the dirt! My garden looks puny next to those plants, but that's my own damn fault. Breathe in, breathe out! Today is a new day and a new beginning! Enjoy your Bougainvillea! What lovely flowers! I'm sure they'll give hours of pleasure there on the deck. It looks like it is your fault and you should be pleased with your results. Lovely. Never heard of any of these but they sure are purty! We have a print of Renoir's "Dance at Bougival." I always think of that when I see the word "bougainvillea." Very pretty flower!